Sphaerocoryphe cranium, copyright St Petersburg Paleontological Laboratory. 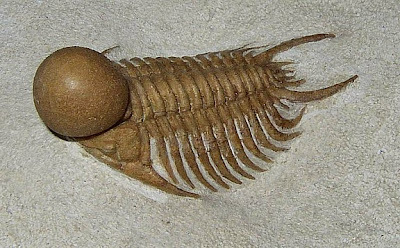 Sphaerocoryphe is a genus of trilobites known from warm waters of the Middle and Late Ordovician of Eurasia, North American and Australia (Přibyl et al. 1985). Characters (from Přibyl et al. 1985): Glabella spherical, bearing a pair of glabellar lobes 1L; thoracic segments with pleural furrows shallow, running longitudinally; pygidium with one or three pairs of spines.